The dodo is an extinct flightless bird whose name has become synonymous with stupidity. But it turns out that the dodo was no bird brain, but instead a reasonably brainy bird. Scientists said on Wednesday they figured out the dodo's brain size and structure based on an analysis of a well-preserved skull from a museum collection. They determined its brain was not unusually small but rather completely in proportion to its body size. "If we take brain size - or rather, volume, as we measured here - as a proxy for intelligence, then the dodo was as smart as a common pigeon," paleontologist Eugenia Gold of Stony Brook University in New York state said. "Common pigeons are actually smarter than they get credit for, as they were trained as message carriers during the world wars." 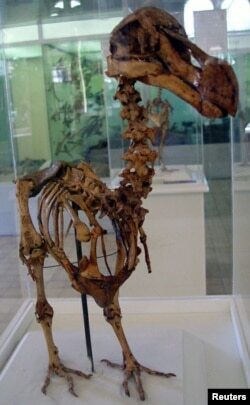 FILE - A skeleton of a Mauritius Dodo bird which was found in a cave at the foot of Le Pouce Mountain at Pailles, in 1900, stands at an exhibition in the Mauritius Institute Museum in Port Louis, Dec. 27, 2005. The dodo lived on the Indian Ocean island of Mauritius. The weird-looking, ground-nesting bird had a pointed beak and rounded head, stood about three feet (one meter) tall and weighed up to about 50 pounds (23 kg). "Why would they fear something they've never seen? They had no natural predators on the islands before humans arrived. Because of this, sailors herded the birds onto their boats for fresh meat later in their voyages. Their willingness to be driven onto the boats is, I think, what led to people thinking they were dumb. It is rather unfair," Gold said. Paleontologist Mark Norell of the American Museum of Natural History in New York explained how the dodo got its reputation: "It had a catchy name, had a ridiculous appearance, was flightless, and because of its lack of fear toward humans, probably due to its isolated habitat, made easy prey: traits which easily could have been attributed to stupidity." But Norell added, "Intelligence is a very hard quantity to measure."